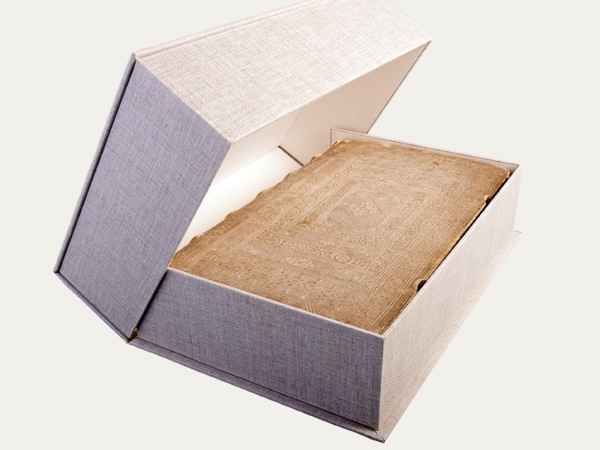 KS 18 Clamshell box – Premium made from 2.0 mm conservation board with a complete fabric lining. Cover lining made of natural linen "Lino Auster 405", item 19200124. The upper and lower cabinets of the box are made of conservation board of 2 mm thickness, are cut mitre and glued together. The inner liner consists of 0.5 mm natural white conservation board. This clamshell box is a special design including a metallic label frame (item 009919) with the window opening on the shorter vertical side.